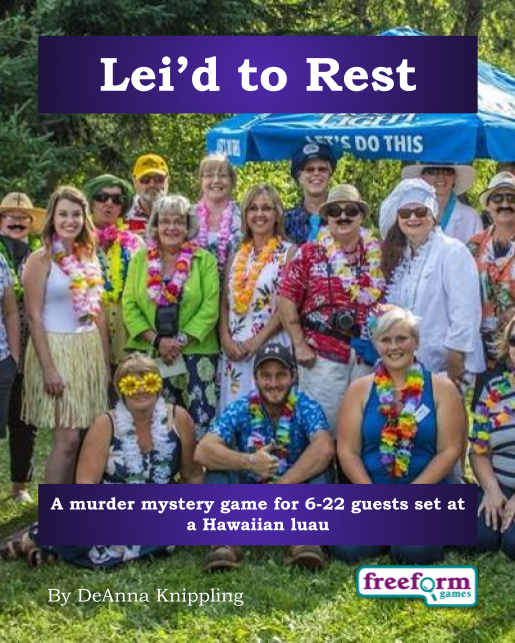 Lei'd to Rest is an interactive murder mystery party for 6-22 guests (plus one host) published by Freeform Games. However, the luau started badly... the bus broke down on the way to the beach, and everyone had to walk the last fifteen minutes. Lei'd to Rest is an interactive murder mystery game, which means that each player receives a detailed character booklet that includes a backstory, objectives for them to solve and information on other characters. In my opinion, once you've played an interactive murder mystery game, you won't want to play any other sort. Set at a beachside luau party on Hawaii, Lei'd to Rest is ideal for any summer party out of doors, maybe with a pool and a barbecue... You can easily give your party a Hawaiian theme by decorating with tiki masks, leis and so on. Lei'd to Rest needs a dedicated host, someone to organise the game (in this case playing the part of the Bus Driver). I really enjoy being the host - you know what's going on and can watch your friends scheme and plot and be devious to one another. Lei'd to Rest is available from Freeform Games and comes in two versions. Click here to buy Lei'd to Rest for 6-12 guests for 29.99 USD. Click her to buy Lei'd to Rest for 6 to 22 guests for $39.99 USD. For more information about Lei'd to Rest, click here to download the free introductory pdf file which includes more details - including background, a full cast list, costume guide and invitations.